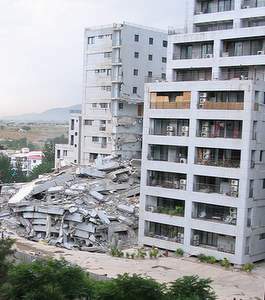 As you are well aware on October 8th, 2005 as a result of corruption and negligence Margala Towers collapsed, leaving 72 people dead and over two hundred families homeless. Subsequently a case was filed in the Supreme Court on behalf of all the victims (Constitutional Petition No. 26 of 2005 Saad Mazhar etc vs. C.D.A. etc.) 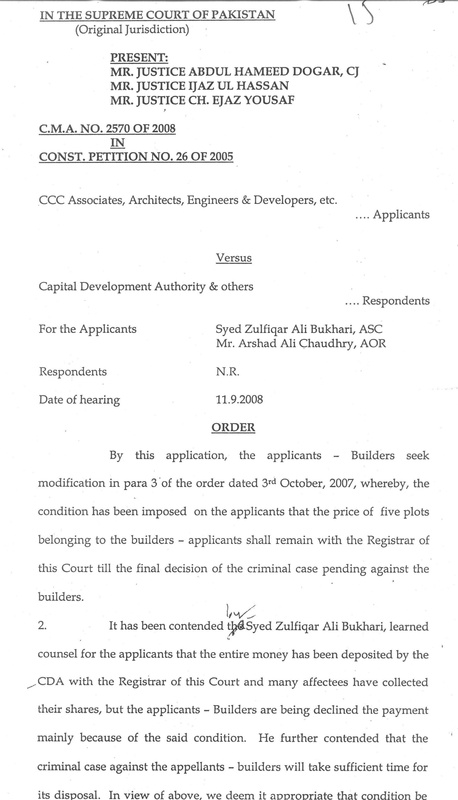 after nearly 2 years of struggling, the victims were compensated due to an historic, precedent setting judgment/order (October 3rd, 2007) by the former Chief Justice Chaudry Iftikhar who ordered the CDA to compensate the victims. During this process the Prime Minister created an Inspection Commission to evaluate the technical causes of the collapse. The final report was made confidential. The victims felt that a milestone had been achieved and an element of accountability had been introduced into the nation and its governance. As a nation we are still grappling with questions of social responsibility and social accountability. 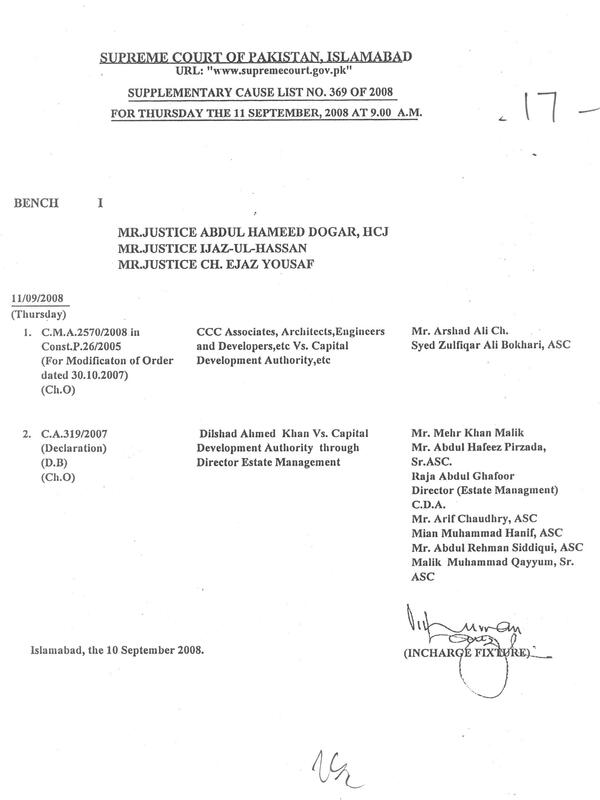 However, last month on September 11th, 2008 an order (see attached file) was issued from the Supreme Court ordering the release of payment or compensation to Ramzan Khokar as well, the corrupt builder of Margala Towers whose innate corruption and negligence claimed 72 precious lives. As you will no doubt notice in the order, the victims were not even given the dignity of representation. Subsequently a review of the order was filed in the Supreme Court to ensure that Ramzan Khokar was not paid by default or inaction on the victims part. Through this open email, we the victims hope to appeal to your conscience, your sense of decency and urge you to highlight this level of corruption that has crept back into all our lives, on any and all platforms known to you. Tell the local or international media, Journalists, lawyers, architects, engineers, developers, humanitarian agencies, family and friends etc. Tell them that you and I have drawn the line. This is where corruption must end. Even if it is just you and I left standing. Let this be our legacy. If your conscience is moved by these few words we also encourage you to join us in lighting candles of hope on October 8th 2008 at Margala Towers to mark the 3rd year of the tragedy. Always remember, just by your mere presence you can make a difference. Be there and become part of a new voice of hope. – rising wave of conscience. i cant believe that the common man struck out yet again. i guess these people dont believe in the afterlife. Ah, soooooo this is why the Dogar Court is what all the fatcats want! 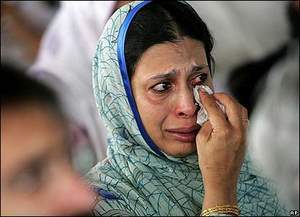 Sorry Ifti, may be you forgot, this is Pakistan…well lately Zardari’s Pakistan…And for the rest of you…TOUGH! I wish Zardari had a apartment in Margala Towers so he’d’ve been disappeared b4 his better-wife, I personally feel that He orchestrated his wife murder in order to gain presidential seat and get immunity from corruption cases. Whatelse do you expect of the dogra adalat? It is a court full of thieves and the head thief is Abdul Hameed Doger. He is there to protect the interests of USA and the corruption of zardari. Thats why he is so favourite of Zardari. Besides he is to make sure that no harm is done to MQM and its leaders due to the investigations of May 12. May Allah Bless Pakistan. with rulers like Mush and Zardari and with Chief Justice Doger, Pakistan is heading fast to disaster. What else can you expect from Dogar and company? In this land of pure justice is almost always trampled upon by the judiciary itself. I wish Zardari had a apartment in Margala Towers so he’d’ve been disappeared b4 his better-half. I personally feel that He orchestrated his wife murder in order to gain presidential seat and to get immunity from corruption cases as well with the help of U.S/UASS sounds similar, isn’t it? Thats why Z didn’t restore purged-judiciary and bring Dog-ar and Naik to get the Carte Blanche to plunder once again Pak by exercising Kleptocracy under the guise of democracy-doesn’t it seem an illusion? All time notorious kleptocrat turned our President. isn’t look ludicrous? doesn’t democracy seem a ‘charade’ ? My eldest sister lives in Margala Town. Thanked God, she didn’t live in Margala Towers where there collapsed occurred. Well her hubby works in HBL for over 2 decades. In conclusion I just wanna say that our kleptocrats aka democrats pols aren’t able to overcome pak current crisis neither economy-wise nor stability-wise. Shouldn’t the land be auctioned off & the proceeds distributed among the affected owners of the apartments. I don’t see any logic of handing it back to the developer? Is there any way i can talk to u …since i was doing a project related to this issue ..will certainly discuss the details later.